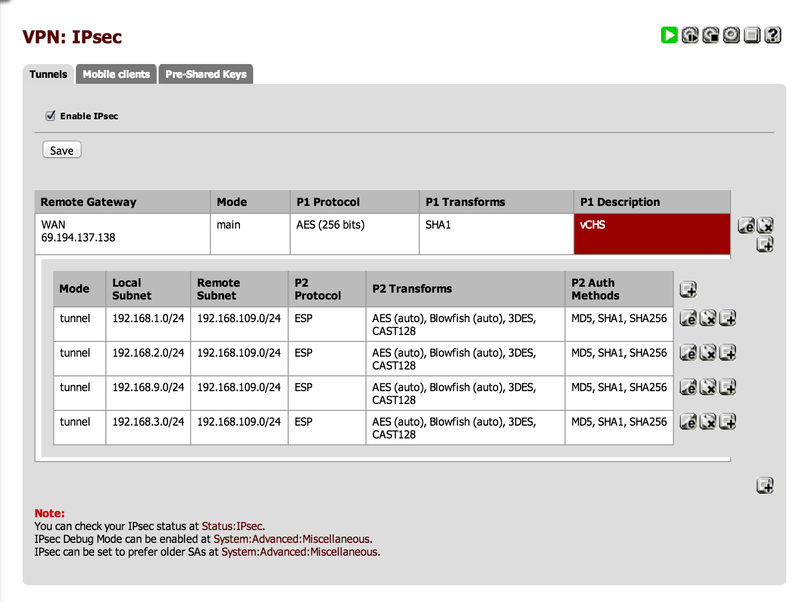 One of my more popular entries has been connecting an EC2 VPC to pfSense by way of an IPSEC tunnel. 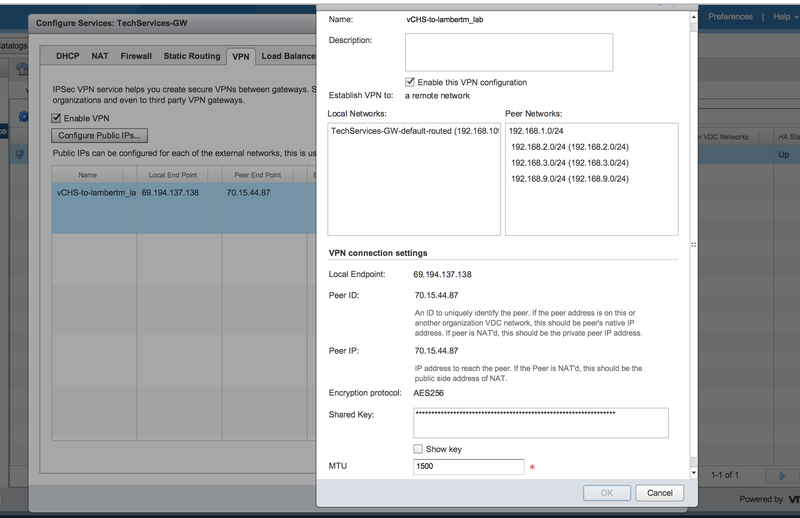 Not surprisingly VMware’s vCHS also provides this capability so in the spirit of connecting pfSense to everything I enthusiastically set out to give it a try. NOTE: Make a note of these values. 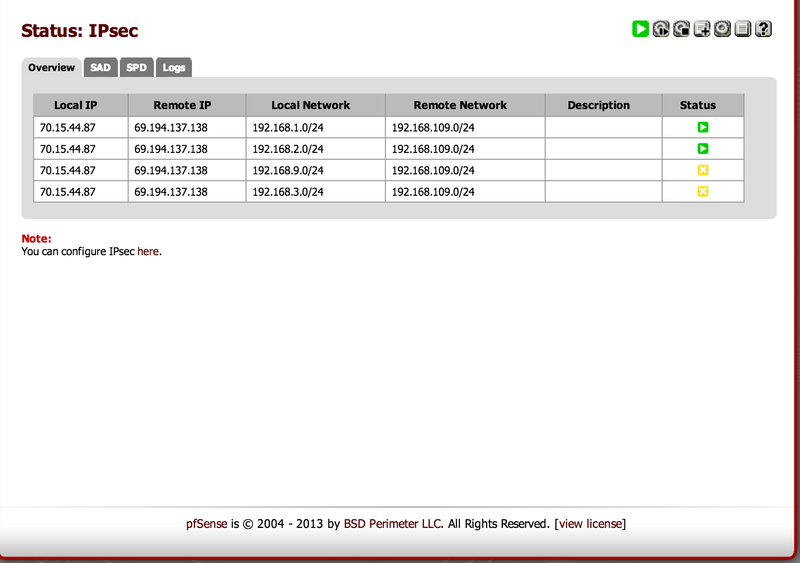 You will need them when setting up the pfSense side. 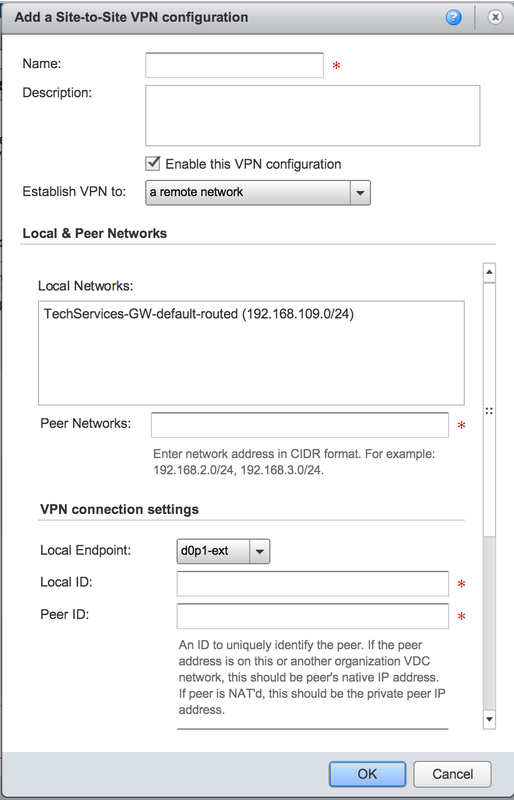 Establish VPN to: vCHS allows you to configure IPSEC tunnels both within vCHS (either within your organization, or to another organization network) as well as to your remote on-premise network. For our purposes we will select “a remote network”. Peer Networks: the networks on the on-prem side of the IPSEC tunnel that will be allowed to pass traffic through. These are the networks that will be visible and reachable from vCHS. Local Endpoint: the vCHS Edge Gateway being configured is selected from the drop-down here. Local ID: In order to establish a secure tunnel, IPSEC endpoints need to identify each other. The identifier of the vCHS endpoint (the vShield Edge) should be entered here. It’s usually a good idea to utilize the IP address of the endpoints for simplicity as their identifier. Peer ID: In order to establish a secure tunnel, IPSEC endpoints need to identify each other. The identifier of the on-prem endpoint should be entered here. It’s usually a good idea to utilize the IP address of the endpoints for simplicity as their identifier. 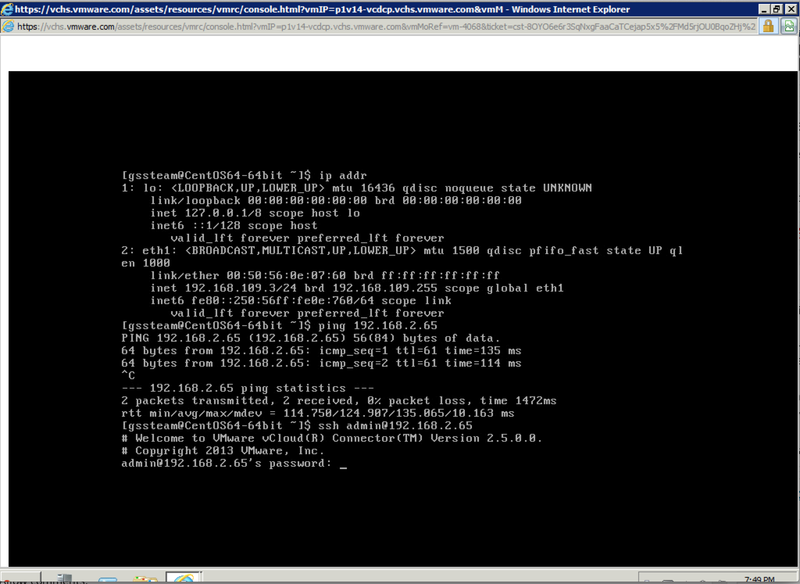 Peer IP: This is the IP address of the public interface on-prem that is establishing the IPSEC tunnel with vCHS. Encryption Protocol: IPSEC is an encrypted IP channel between two endpoints. It supports a range of different protocols for establishing this secure channel. The options here are AES, AES256 or triple DES (3DES) and the important thing is that both sides must match (vCHS and your on-prem network edge). Shared Key/Show Key: in able to establish the secure tunnel, IPSEC endpoints must have a way to authenticate each other and mutually validate each others authenticity. The simplest method for authentication is pre-shared key (PSK) and this is sufficient for static endpoints like site-to-site VPN. 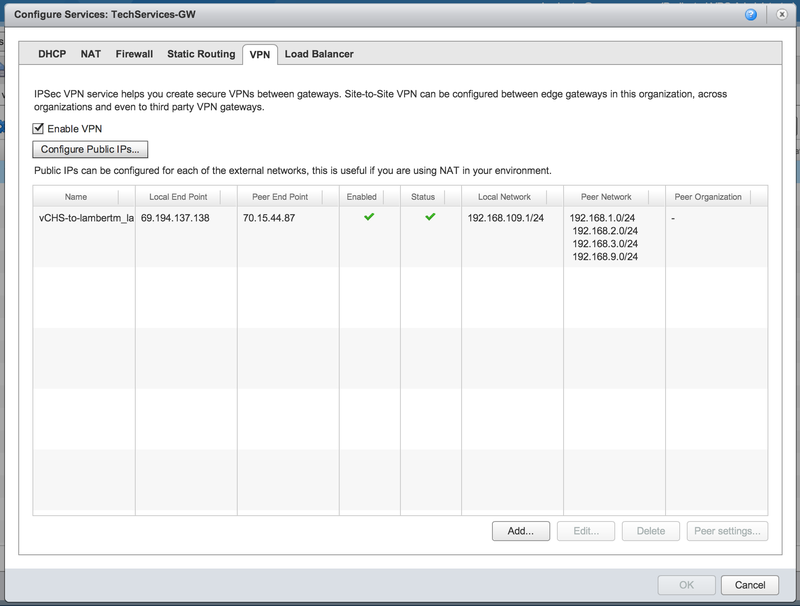 vCHS requires PSK and autogenerates one when a new VPN connection is created. Clicking “Show Key” will allow you to copy and paste this key to your on-prem endpoint configuration. MTU: the IP MTU is the IP MTU 🙂 The allowed maximum size of the IP packet. 1500 being the standard for ethernet. In some cases, depending on endpoint device configurations, a lower MTU may be required. 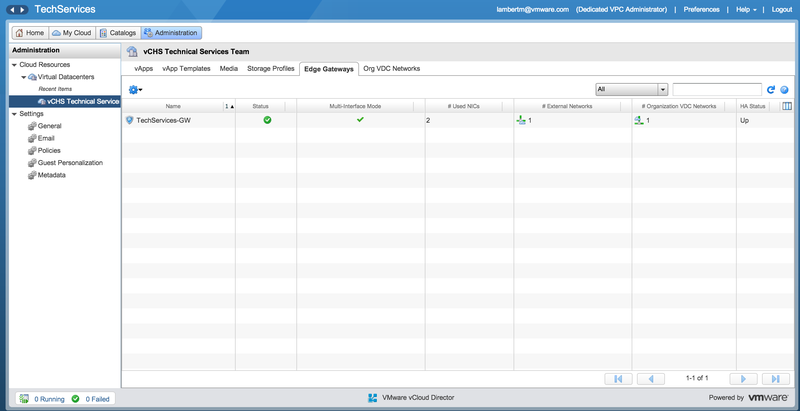 If so, this is the spot in the vCHS vShield Edge configuration to set it. 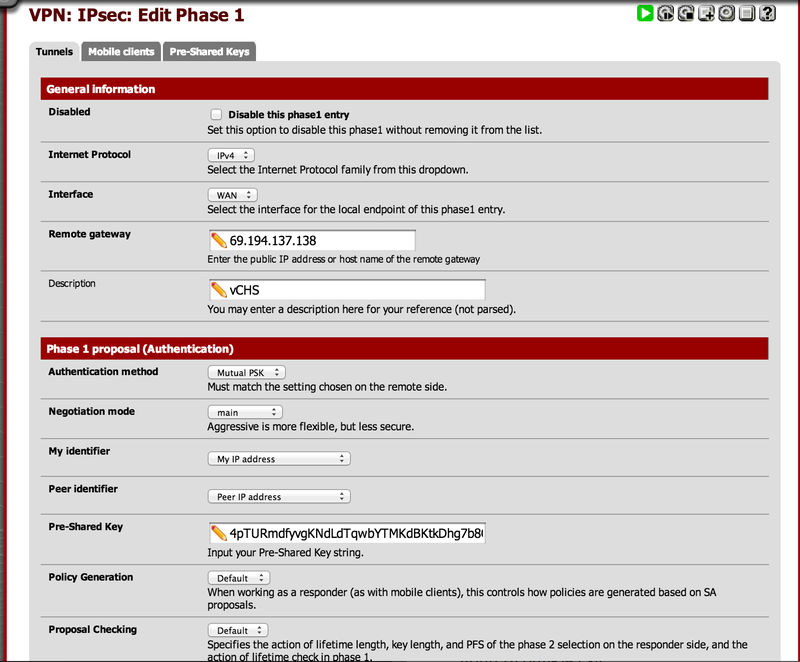 Negotiation Mode: IPSEC supports two modes for establishing the tunnel – “main” and “aggressive”. Main mode is a multiple packet exchange and is more secure. Aggressive mode attempts to consolidate identification and authentication into a single packet exchange and is faster and, in some cases, more flexible. My advice is to lead with Main Mode and fallback to Aggressive Mode if the circumstances require it. Identifiers (My and Peer): the key is to match what was configured for these values on the vCHS side. 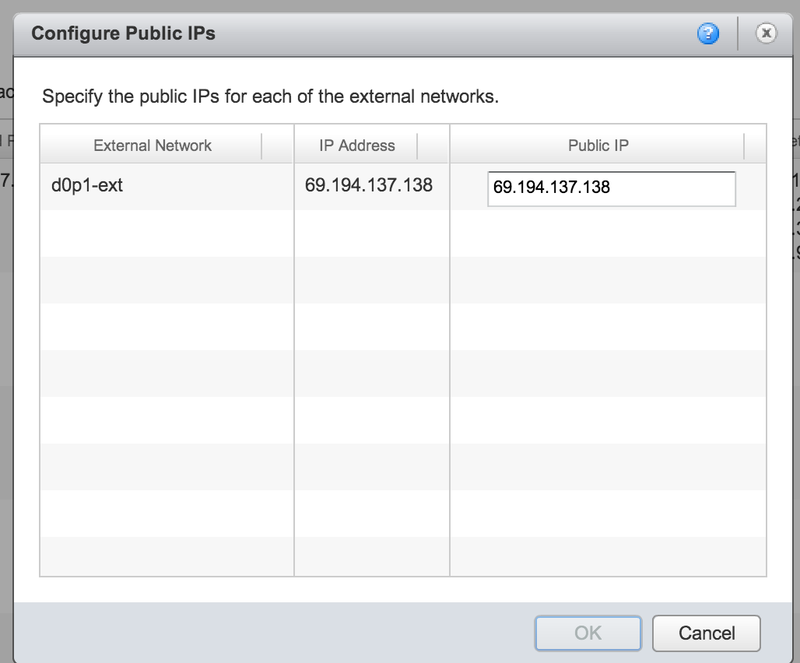 In this case “Peer” is vCHS obviously and, once again, using IP address as an identifier makes things easier generally. Encryption Algorithm: as mentioned above, the key here is to make sure both sides match. In our case we are selecting AES as the encryption protocol and 256 bits as the key size. Hash Algorithm: the mutually agreed upon hash protocol for ensuring message integrity In the case of vCHS the correct choice is SHA1. DH Key Group: IPSEC relies on the diffie-hellman (DH) internet key exchange (IKE) protocol for establishing the encryption keys used to secure the tunnel. Each side must agree on a key grouping (key size). In the case of vCHS (and in most similar cases actually), select 2. Other values can be left at default or, situationally, changed. 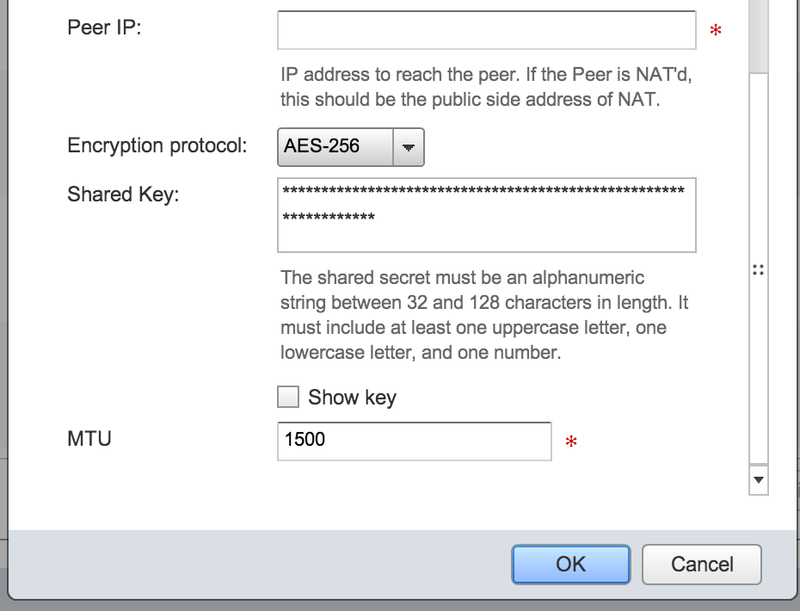 For example “NAT traversal” may be required if your pfSense endpoint is behind a NAT and not directly connected to the internet. If this is your case it is also worth noting that the endpoint identifier IP would be the IP of the pfSense gateway and not of the NAT (but obviously vCHS would be connecting to the public IP presented by that NAT endpoint). Lifetime is another value that might be changed based on individual requirements. The lifetime specifies the time after which the endpoints will renew the tunnel connection. The key things to enter here are the remote endpoint network and the local endpoint network being peered. 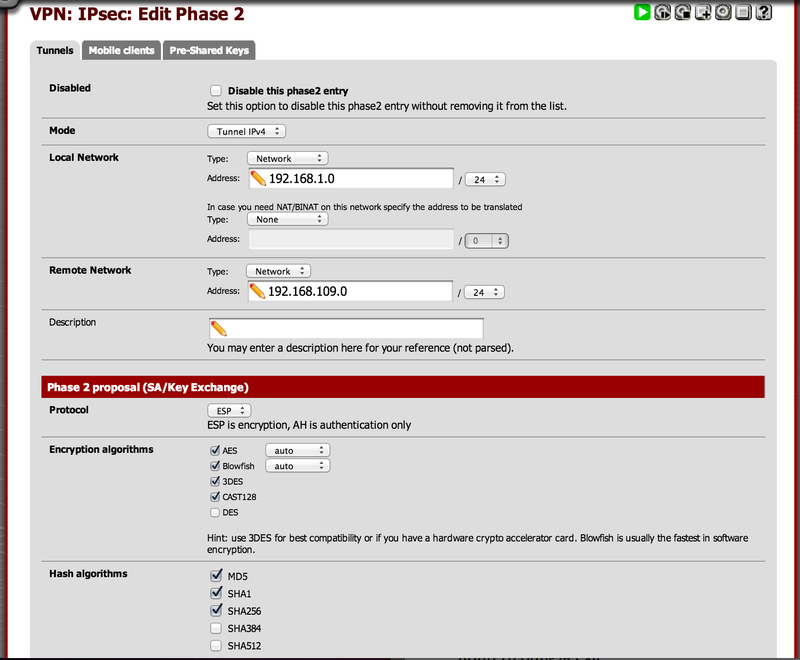 In my case I create a Phase 2 entry for each local subnet because I have many local subnets and one remote. Your mileage certainly will vary on this one. For all of the other options default is fine. Encryption and Hash options can be narrowed to what is specified in Phase 1, but don’t need to be. And with that we have… Hybrid Cloud! Hope this was helpful and, when in doubt, dust off that IPSEC handbook and pay close attention to what the logs are telling you.